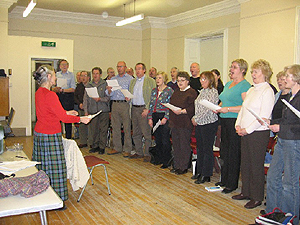 Internationally renowned folklorist and singer Margaret Bennett has invited the Aberfeldy & District Gaelic Choir to accompany her on a new CD she will soon be recording. The Choir will be marking the occasion in grand style with a Celebration Banquet at Castle Menzies, near Aberfeldy, on Saturday June 23rd. If any former Choir members or supporters would like to go, limited tickets are available from Sarah Brown on 01350 727768.